Knit Native American Designs by Darlene Marshall a registered member of the Hupa Tribe are featured in Knit Caps, Baby Clothes, Knit Blankets, Dance Shawls, and much more. 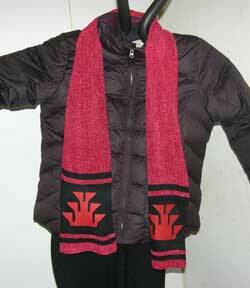 Authentic Native American Designs, Blankets, and Knit Clothes are offered by Hupa, Karuk, Yurok Artisan - Darlene Marshall. This native American showroom features a very talented artisan: Darlene Marshall owner of Native Design and Art in Hoopa, Darlene states: "My company, Native Design and Art is an Indian based and Indian owned company. The designs used in the products are the basket designs of my people. I am Hupa, Karuk, and Yurok and my business is located on the Hupa Reservation." Basketry designs that date back over a hundred years are kept alive as they are knit on blankets, caps, headbands, shrugs, wall hangings, hand painted knits, scarves, and much more! The knit products below show some of Darlene Marshall's basketry designs in a variety of hand loomed knit items. Then, Go to The Knit Tree's online catalog - Native American Category, to see the knit designs that Native Design and Art is offering for sale through The Knit Tree's online catalog. Tip: if you select the Artisan box, then select: Native Design and Art, you can bring up all that Artisan's products on one page to view. Native American Art Galleries or Stores are welcome to inquire on Native Design and Art's Wholesale Information. NOTE:Click on ll images to see an enlargement of the photo! "Stairway to Heaven Knit Basketry Cap in Sizes Baby Child and Adults". The Hupa Basket Weavers are well known for their Basket Caps. This cap is knit with that in mind and is in the shape of a Woven Basket Cap. It was the first item in Darlene Marshall's hand loomed knit products. Knowing that not everyone could afford the Basket Caps by the Basket Weavers, Darlene offers her knit version with the basketry motifs. It also is a way of 'bridging' the cultures of her ancestors and preserving these beautiful motifs in the modern world. 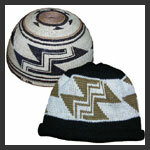 See Native Design and Art for more information and visit our Store to purchase a knit basketry cap. Basketry knit Indian caps come in a variety of sizes ranging from baby new born and 6 months to child size beanies and adult sizes Native caps. . Baby Indian caps are in cotton or acrylic and our Native children and adult caps are offered in our superfine merino wool or acrylic. "Knit Chenille Scarf handpainted with the Native American Foot Design". Unique Cotton Knee High hand painted knit sock slipper with the frog foot Native Ameerican design. Hand Painting on Knits involves many steps. First painting must be done on Natural Fibers. We use cotton, shiney rayon, bamboo, and wool rayon. Item is Knit, yarn ends are finished off and item is hard pressed to prepare for painting. Item is painted, each color is dried with a hair dryer before applying another color and dependent upon the color of the yarn or color of the paint, more than one layer of a color may have to be applied – again drying between each layer with the hair dryer. Item is allowed to set for 3 days to ensure the paint is dried. The painted item is hard pressed again in a process to ‘set the paint’ into the yarn fabric. Finally the item is assembled and final steamed before labeling and packaging. Since the creating of a hand painted knit involves the different steps, it is stated if the item is in inventory. If it is not in inventory, please allow two weeks for the item to be hand crafted. Please go to our Native Hand Painting Category to find the scarves and Slippers that we are offering. Indian Knit Hand loomed Blankets in merino wool or acrylic yarn. These are Unique, Quality,4 Color Indian Blankets. The book "Language of the Robe" by Robert W. Kapoun with Charles J. Lohrmann shows in many ways the importance of the Native American Blanket and the honor in receiving such a gift. The featured Indian designs in image of the blankets to the left are the full size Friendship design, Frog Foot Indian motif, and Swallow tail Indian symbol. 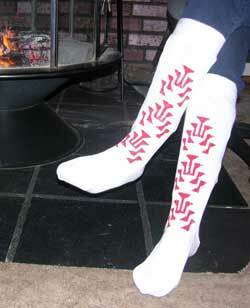 The lap size blanket is the Native American Foot Design. 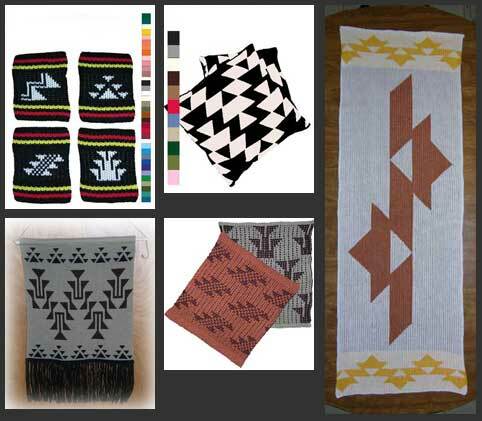 Read about the Indian designs in the product descriptions of our Indian knit blankets. 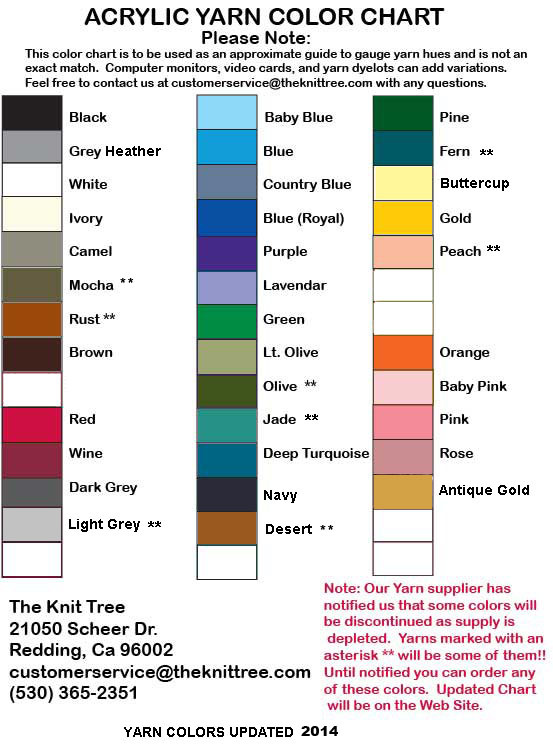 You can even select your own 4 colors to fit your home decor from our available superfine merino wool yarn color chart or our high quality acrylic yarn color chart. All the featured Indian Symbols of Friendship, Frog Foot, Swallow Tail, Stairway to Heaven or Ladders to the Sky, and Osprey are also offered in two color versions of the hand loomed knit blankets. Pick from our standard color or your own color way. Many Tribes use Geometric Designs in their Basketry and Beadwork, therefore the Friendship Design or these other Indian symbols may be recognized by another name by another Indian Nation. These popular Native designs are seen often on woven baskets in the museums or collections throughout the country. 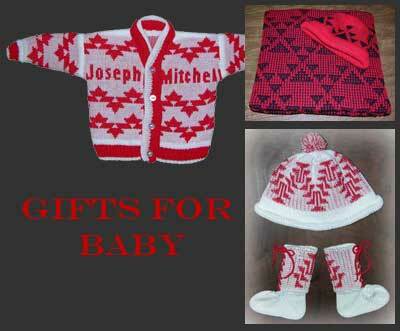 Collection of knit baby gifts including blankets, baby sweaters, and cap bootie set. Come back often and check our Baby Sets Category of our Online Shopping Catalog - We plan on adding more items for Baby and growing Children as well in Cotton and Acrylic Yarns. If you have a special Indian motif that you want hand loomed on your baby clothes contact us to express your wishes. We love to knit new Indian designs especially for you. Knit Baby Clothes with Native American Basketry Designs are Hand loomed with Pride and Loving Care..
Photo of Indian Morning Star design featured on this personalized knit baby blanket and cap set. Our babies love their personalized baby blanket. Cooper and Noah are the pride of the family all wrapped up in the baby blankets knit especially for them. The matching cap can be ordered in newborn which fits up to approximately 3 months, or its available in the 6 month size which actually is the next size up. It is also available in child and adult sizes. This personalized baby blanket and knit cap set with the friendship motif makes a wonderful gift for baby showers or welcome gift for baby in the crib baby blanket size. . The personalized blanket is available by itself in several other Native American Designs. Save money by combining it in the knit baby blanket and knit baby cap set. Go to the online store catalog to place your order for your personalized knit baby blanket. Darlene offers several color choices: and different basketry Indian designs. We try to fill all orders within two weeks. First come, first serve - so get your orders in early! Native American Knit Shrugs and Indian Hand loomed Knit Children Sweaters make great Mother and Child Gifts ~ Creative ~ Unique ! Photo of a special order knit shrug and matching one of a kind child sweater. Knit Indian shrugs make a great cover up and knit accessory for everyday casual or dressy events. Darlene Marshall's Native American shrugs with the Indian designs of her people are a unique gift especially since it is One size fits Most.. These shrugs are especially popular with the Elders, the rectangular shape and the ribbed cuffs makes it easy to wear. You can order them in the easy wash and wear care acrylic knit shrugs. Select your own colors or choose from our standard inventory colors. Go to our Online catalog in the Native American Showroom Shrugs and Ponchos category to make your selection.. 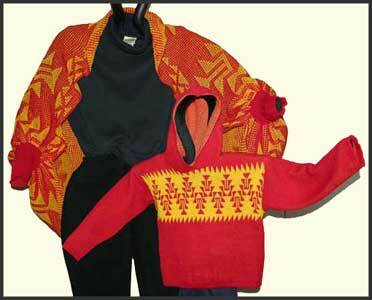 The image at the left shows the Frog Foot Indian Design in the Knit shrug and the Child's knit tunic with hood. in Red and Gold. Email customer service under contact us to special order a special color. photo of collection of home decor knits coasters wall hangings wash rags and more. 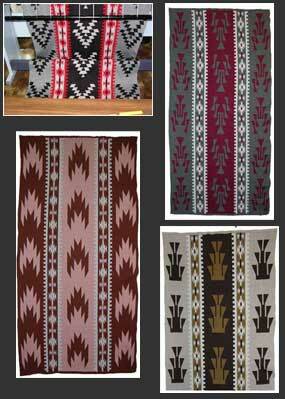 Your Home Decor will be Unique with Native American Indian designs hand loomed in several home decorating knit items. The image at the right features our knit Indian coaster set with the four Indian symbols of Stairway to Heaven, Goose, Flint, and Foot. The Friendship motif is on this pair of merino wool pillow slips. The Morning Star Indian design is featured on the cotton table runner. The wall hanging has a casing at the top with a wooden dowel and cord hanger for easy display.The Frog Foot motif bordered by the Goose design is accented with fringe in this Indian wall hanging..Cotton wash clothes with the Flint and Foot Indian designs will dress up any kitchen and make a great inexpensive gift ~ great for bridal showers and hostess gifts!